Amulets, Crystals, Stones and Talismans have beneficial properties to bring balance and harmony to people on various levels (physical, emotional, mental and spiritual) but to be truly effective they must be authentic and imbued with the right meaning of the popular tradition from which they derive. In simple words they have to be “lived” and “sacred”, full of positive energies that people or mystical places of belonging have really given them. These objects represent a valid aid, a traditional and meditative practice, to ensure that our spiritual energy is channeled, through the generation of positive impulses and brain waves, in a sort of ritual that can help us in every aspect of everyday life. Meditation and the right concentration, obtained with the awareness of being in front of a true object, sacred and revered by millions of people, generate in our subconscious, positive brainwaves that belong to a higher level, the so-called “seventh sense“, that is, that sphere of our unconscious ego enclosed and hidden in our soul, wrapped and protected as in the womb, by a sort of ancestral amniotic fluid, which nourishes and regenerates itself in cosmic energy. All these items can be found on reservation. Being original and authentic, one of our representatives will go to pick them up directly in their place of origin, so you can get them 3 to 4 months after the reservation. In the case of the objects that are difficult to find, such as the Tārā divinity, waiting times may also be longer. In any case, the order will be processed only in the presence of the original and authentic product. To these articles is added a variable quota between 10, 20 and 30 euros (at your discretion) to be allocated to the poor children of the Tibetan valleys, to buy them rice, clothes, shoes and pay for school education. 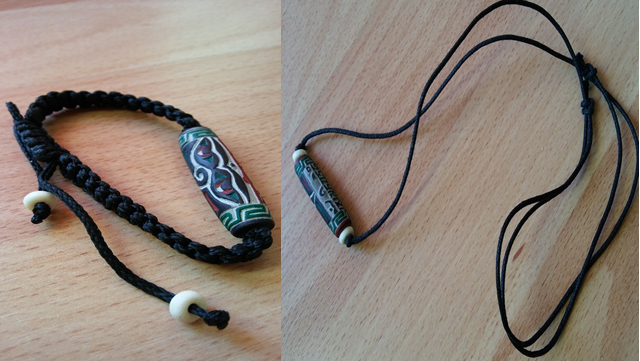 Bracelet and necklace of slate stone, hand carved and decorated with mantra OM mani padme hum. “Buddha’s Eyes” – symbol of wisdom and enlightenment. Nepal, Tibet. The eye of the Buddha serves to keep us away from evil and depicts the spiritual strength and ability of Buddha to see everywhere in order to protect those who welcome him in his home. Place of origin: an Everest valley, in the Tibetan mountains. Object made by hand by local artisans in sacred and mystical places. Blessed by Tibetan monks, in uncontaminated and pure Buddhist temples, devoid of negative energies typical of Western regions and consumerist traditions. 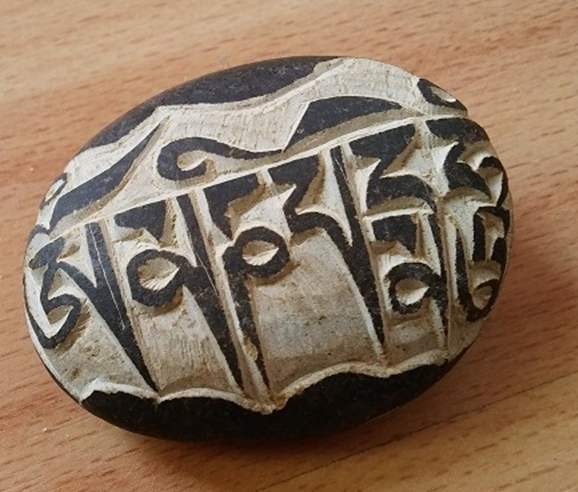 Hand-carved stone with Tibetan mantra linked to compassion and fraternal spirit. Votive prayer carried out by artisans working in the area of Buddhist sacred temples in Nepal. Tibet. Its meaning is strongly symbolic beyond its literal translation and is recommended in all situations of danger or suffering, or to help those who are in conditions of displeasure, pain and anguish. 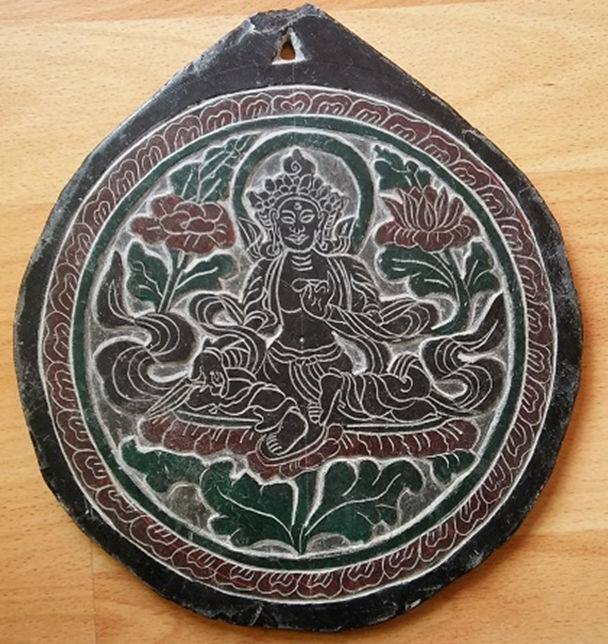 Tara, a deity carved by hand on slate stone and decorated. Tara the Liberator and the Mother of all the Buddhas: she is active, compassionate, protector. It is said that when it is invoked, it arrives as fast as the wind to help people in need. No dark entity or negativity can resist it, dissolves negative karma, makes people gain positive karma and elevates the spirit profoundly. Namaste, namaste, namastèe (नमस्ते) or namaskar (नमस्कार) is a greeting originating in the area of Nepal and India. In Asian culture, this gesture is a mudra, a symbolic gesture also used in yoga and indicates the divinity that is in all of us. The word namaste literally means “I bow to you”, and derives from Sanskrit: namas (bow, greet with reverence) and you (to you). This word is associated with a spiritual value, so it can perhaps be translated more fully as: “I unite my body and mind, concentrating on my divine potential, and bow to the same potential that is within you“. 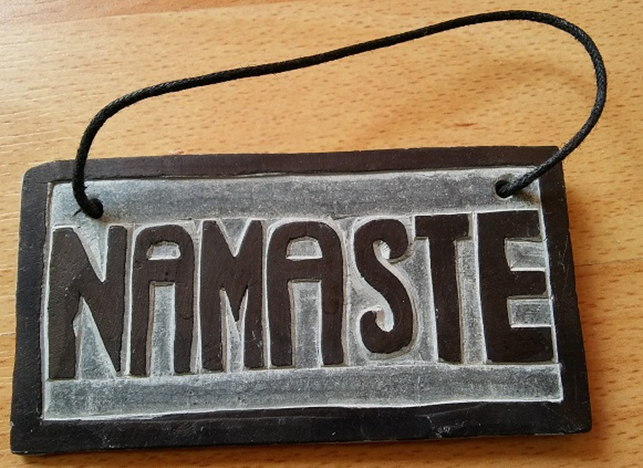 The namaste placed at the entrance of a house has the meaning of good reception and good omen. 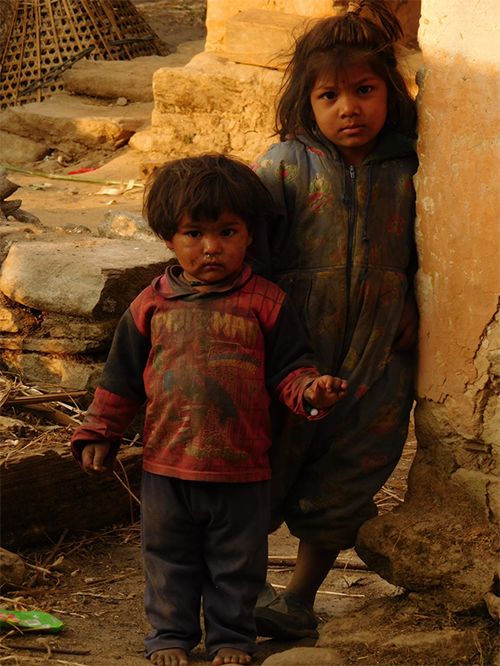 Place of origin: Nepalese, Tibetan villages. Handmade by local artisans, blessed by Tibetan monks, in Buddhist temples, and used to protect the homes of Buddhist monks in the temples of the Hymala valley. Tibetan bells, handcrafted with original engravings of the place of belonging. 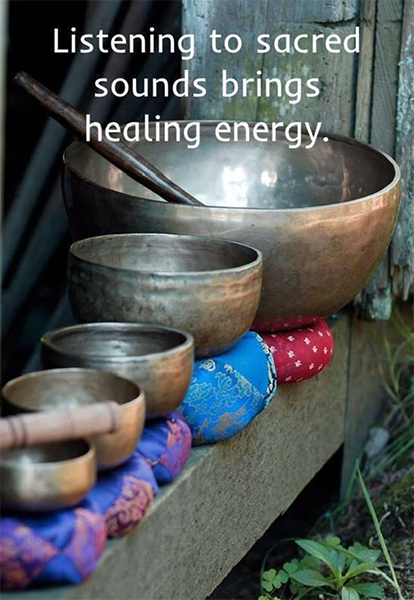 Used as sound meditation can have a therapeutic value. The principle is that of resonance / consonance: the sound expands with circular movements, and acts on the energy blocks facilitating the dissolution. Poly harmonic vibration for positive redundancy, helps concentration. The sound of the ohm for meditation, yoga and to cure the origin of all malaise, stress! Place of origin: The Tibetan bells are made up of seven metals and handcrafted in Tibet / Nepal. Article used by local religious people during the practices of meditation, reiki, Yoga.